Heading for calmer and warmer conditions we drove straight back up North, through Hobart with only a brief lunch stop at Richmond to see the oldest bridge in Australia, built in 1823. Then on to our next camp at Friendly Beaches, close to Coles Bay. 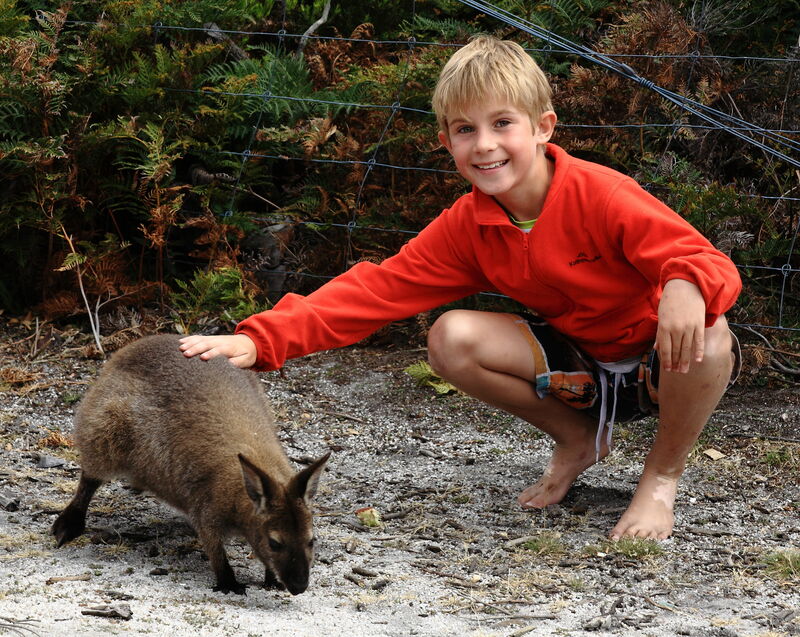 Here we captured photographic evidence of Xavier completing an easy challenge of patting a local animal, we think it is a Forresters Wallaby – let us know if this is right or not. Friendly Beach saw the first landing of an edible, legal size fish, with a salmon and wrasse caught from the rocks. Xavier and I had an early morning jog to the end of the beach and back. A trip into Coles Bay saw us visiting Honeymoon Beach, Lighthouse Lookout and Sleepy Cove. Once again the crystal clear waters and colourful landscape is hard to capture in photos, especially when you have a speck of dust on your sensor! Hannah seized the moment, donned springsuit, mask and snorkel and dived in, whilst everyone else was still feeling the cold a little too much. At the lookout we discovered Freycinet was the place to find lizards in Tasmania and we saw two different types, everywhere! Hannah and Oscar lay down to measure how long a Bluefin Tuna is, and Oscar eyed up how hard his challenge to catch and eat one is! The twitching highlight was the scarlet robin and green rosellas but we also found what appears to be a small dead possum by the track.